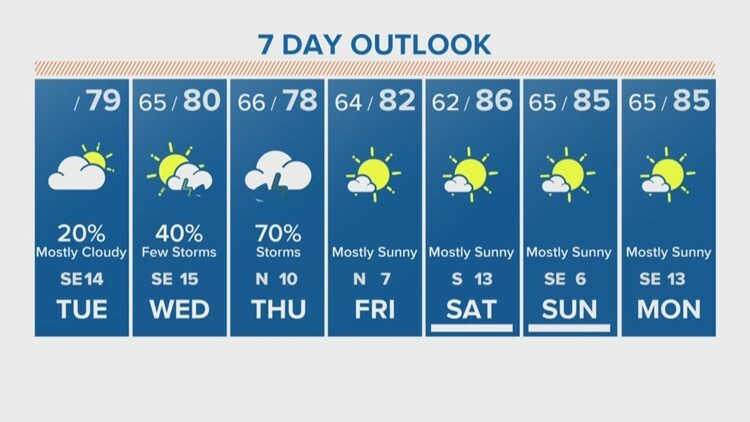 Houston Forecast: Light rain today- strong storms tonight. Stay weather ready. Cloudy skies, mild temperatures and the chance for a few showers will be possible for much of the day today. Strong storms move in this evening. HOUSTON — Cloudy and muggy with temperatures in the 60s and 70s this morning climbing to the upper 70s this afternoon. We will see a slight rain chance during the day but an increased threat of strong to severe storms will move in by tonight. WEDNESDAY: Expect cloudy breezy conditions all day with a 30 percent chance for a passing rain shower. Any activity we see will be light. WEDNESDAY NIGHT: The greatest storm threat will be overnight from 7 p.m. to 4 a.m. The severe threat is low but it's there. Brief heavy rain and minor street ponding, strong wind gusts and hail will be possible. The tornado threat is very low, but not zero, so we'll watch for that as well. THURSDAY: Rain ends by early morning, then a north breeze and drier air will move in for Friday and the weekend. Our meteorologists are going into weather watch Wednesday around 3 p.m. as the thunderstorms make their way to our area. Make sure you stay up to date with the weather this weekend by tuning into our newscasts or downloading our KHOU 11 app.